Cybersecurity solutions cannot be a self-serving or an isolated approach they need to be part of a holistic solution. I have avoided this discussion in the past because understanding and highlighting all of the potential security and privacy concerns could paralyze us. For some 20 years plus we have operated in a wild west manner mashing our machines with the open internet achieving amazing things quickly. I do not want to lose this platform of global innovation and participation. Yet, our Building Automation Systems are considered not secure. We need to fix this as we install more and more sophisticated smart building technologies, many of which involve IT systems, we have become IT people. We need to think like IT people, we need to revisit our existing systems security and clean up our mess. 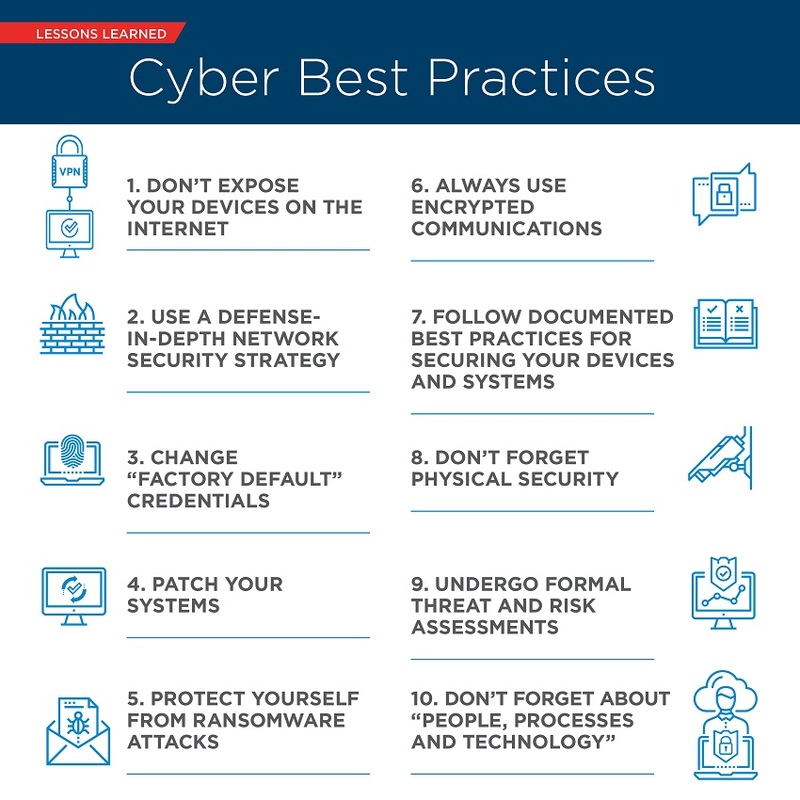 We gathered the views of several Cybersecurity experts to provide us with advice on how to proceed without immobilizing ourselves. I am extremely pleased and amazed at the width and depth of coverage. James Lee, CEO, Cimetrics, Inc. "Our collective success is based on our weakest link. Our industry is inherently collaborative. We seldom work alone on a project, and partnering is our modus operandi." The first and most important aspect for all players in the industry is that cybersecurity is everyone’s business, not just the experts. Yes, cybersecurity is a complex subject but we are not all going to nerd out on the intricacies of ciphers, zero-day threats, certificates and so on. What every single professional must demand is that our devices, systems, and buildings are secure from cyber threats. Every proposal, project meeting and company planning session going forward must discuss how cybersecurity is being addressed in that instance. This leads to my second point: Our collective success is based on our weakest link. Our industry is inherently collaborative. We seldom work alone on a project, and partnering is our modus operandi. This means not only does each player need to deal with cybersecurity in their work, but it is the task of everyone to ensure others in the value chain deliver solutions that are secure. A useful tool many other industries use to chart their process of bringing cybersecurity to the forefront is the National Institute of Standards and Technology (NIST) Cybersecurity Framework, a comprehensive set of standards, guidelines and best practices created through a collaborative process by the U.S. government agency responsible for cybersecurity matters. Fred Gordy of Intelligent Buildings, LLC provides cybersecurity evaluation of building control systems. The State of BAS Cybersecurity IB performs a series of assessments both before the site visit and once on site. There are several tools and methods we use to complete a holistic cybersecurity evaluation of building control systems. In 2018 the number of assessments we performed increased to more than double of 2017. This was due in part to the growing awareness of the need for securing building control systems, but also the real and present danger of attacks to building control systems. In this article, I will share the results of assessments and BAS attacks we have first-hand knowledge of. Our contributing editor Anto Budiardjo has been encouraging me to get this discussion to be the theme for April. I agree. Facility IT mandates that information flows securely and easily between all elements of BAS, FM and IT. Summary; In today’s data-driven economy and smart based buildings, it is essential we collect, store and adequately protect data and proprietary secrets. Failure to do so will significantly damage a company’s brand, have an adverse effect on operations and directly impact revenue and profitability. Cybersecurity is a partnership: we all have a role to play. And yet, I still hear the confusion in the building automation world about what this framework means for us. Many buildings are slowly marching forward in that journey to “smart.” Do we really have to worry about cybersecurity? Noller: A smart building platform is a powerful cybersecurity tool that empowers your FM team to easily perform continuous commissioning as well as regularly assess device connectivity and network integrity. Cloud-hosted smart building solutions are often the most secure, updating automatically for protection against the latest malware. Additionally, a cloud solution tends not to require the regular dispatch of software engineers for functionality customization and support. By integrating diverse hardware and software, an effective smart building solution will support a range of stakeholders, driving asset visibility and enabling more cost-effective building performance. To extend the flexibility of your FM team, consider a solution with a mobile app and empower them to communicate about critical issues quickly and effectively while on the go. How secure is your commercial real estate portfolio? Download this free e-book and safeguard your portfolio against cybersecurity threats now. This article is a collection of odds and ends, brought out by the announcement that this month is the Holistic Cybersecurity issue. Security, including cybersecurity, is making sure the needed information or action is reliably available at the right time to the right people. As noted elsewhere, many of the most useful and exciting changes in how we interact with the world, and the world with us, are in the hidden world of buildings and their services. In May 2008, I named this the Service Oriented Building (SOB) and called for it to be a full-fledged partner with the then emerging Service Oriented Architecture (SOA) for enterprise systems. Since then microservices have become the norm for assembling highly scalable, highly resilient, and highly secure systems. Service integration treats remote systems as black boxes, and the only remote integration is requesting from or providing services to that black box. Service request does not care about the mechanisms in that black box, only about the service provided. This minimizes communication between systems, already a step forward in cybersecurity. A black box providing a service can be designed so that none but the other components in the box can see or interact with them. Service Oriented systems provide a smaller attack service. Trust is the new Gold! Mirko Ross In fact: You need “trusted” data and “trusted” devices providing data services. As machine learning is relied on more often for automated decisions, Cybercriminals can try to attack machine learning algorithms. Influencing the training data is highly dangerous, with the goal of manipulating the results of the machine learning algorithm predictive model. "BACnet Secure Connect" written by members of the BACnet IT working group. Niagara systems integrators Harden Your Smart Building Against Cyber Threats. Cybersecurity as a top priority, and we are dedicated to continuously improving the security posture of our products and providing guidance to Niagara systems integrators, business partners, and facility managers. https://www.isasecure.org/en-US/ IEC 62443 Standards and ISASecure® Certification: Applicability to Building Control Systems The ISASecure® Certification Program can accelerate BCS industry cybersecurity initiatives. https://ics-cert.us-cert.gov/ The Cybersecurity and Infrastructure Security Agency (CISA) incorporates an Industrial Control Systems (ICS) element that works to reduce risks within and across all critical infrastructure sectors by partnering with law enforcement agencies and the intelligence community and coordinating efforts among Federal, state, local, and tribal governments and control systems owners, operators, and vendors. The not-so-definitive guide to cybersecurity and data privacy laws US cybersecurity and data privacy laws are, to put it lightly, a mess. Years of piecemeal legislation, Supreme Court decisions, and government surveillance crises, along with repeated corporate failures to protect user data, have created a legal landscape that is, for the American public and American businesses, confusing, complicated, and downright annoying. CRE CYBERSECURITY FORUM June 12 | 8:00 am - 11:45 am | Nashville Music City Center Every company is at a different part of the cybersecurity journey. Most Real Estate organizations begin by focusing on enterprise related issues which can impact operations. Recently, with the increase in cyber-attacks on the built environment, more companies have begun the task of securing the building and all its systems. While some knowledge can be garnered from critical infrastructure experiences, protecting buildings from cyber threats is a relatively new phenomenon. This session will provide insight on what a comprehensive Building Cybersecurity Program might look like. In addition to presenting the foundational plan, some Monday morning advice on ‘where to begin’ will also be provided.